I believe in taking an holistic approach to training, because in order to make the most of your time, you need to understand the physical, mental, and tactical sides of your life. 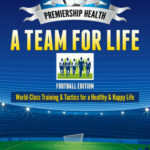 It is only by improving and training in each of these key areas can you call yourself a Premiership Health Manager, and really begin to see progress in how well you play. It involves knowing what you want to change, working intensely to change it, incorporating sufficient rest and recovery (R&R) to allow development and growth to occur, and then consistently monitoring and looking for ways to improve. Whilst all the time keeping your ‘Purpose’ in mind.